Out of everything I have tried, failed, kept, modified, or threw out during my transition to 3-dimensional science learning, my favorite piece has been requiring students to construct explanations. This has also been (and still is) one of the biggest struggles for my students however it is such an important piece that it will forever be a permanent process in my classroom. It may take 6 months to the whole school year to see growth but it is worth it. When I first heard about science writing I immediately thought of writing lab reports. That’s something I had to do in college, and in my research career so I thought it’d be simple enough to incorporate into my classroom. Boy was I wrong! I tried numerous ways of doing them but just struggled to get students to write anything clear and coherent. 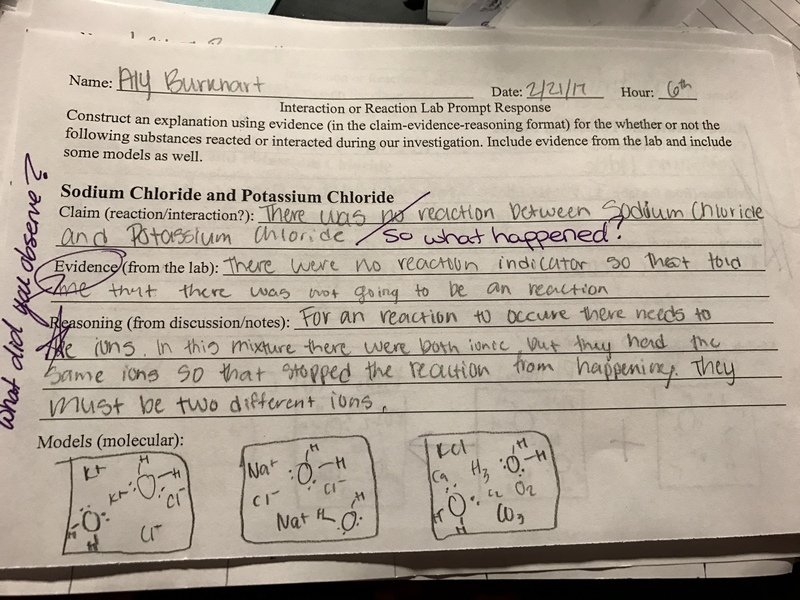 It was so frustrating that students were not able to see the connection that writing a paper in English with an introduction/body/conclusion was the exact same thing I was asking for in Science! I tried making connections, and was unsuccessful; because let’s be real, there’s a reason I’m not an English teacher LOL I lack the strategies that teach students how to write. So I gave up; I decided it was a bigger battle than I was willing to fight at the time and some day I’ll figure something else out. In the mean time, I figured writing notes, lab observations, and in complete sentences for short answer questions was just going to be good enough. Deep down I knew that was not what was meant by writing in science but it was going to have to do. Then two years ago I was learning about the science and engineering practice of constructing explanations during a PD training with Brett Moulding. During this PD, I was required to write these couple sentence responses, or do a few minutes of silent sustained writing to collect my thoughts about something we were investigating. 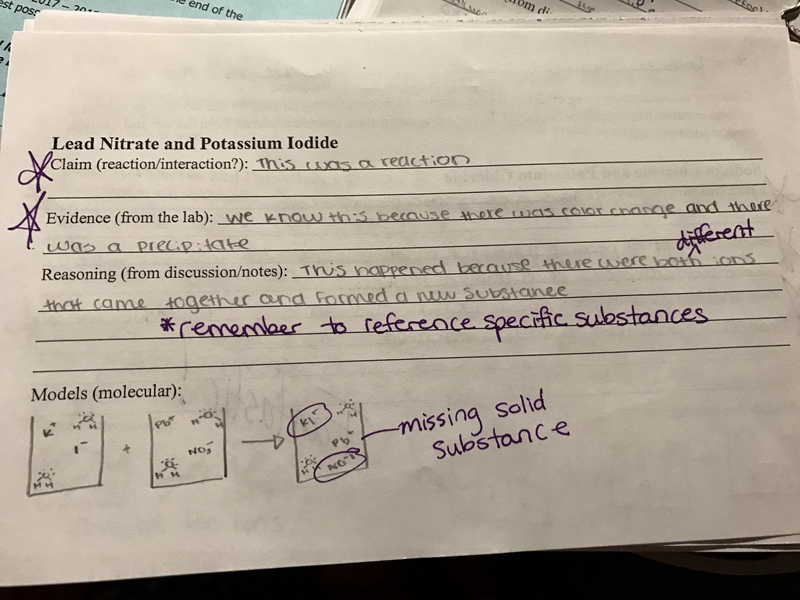 I began to see how writing in science did not mean “lab reports” it meant getting students to write down what they were thinking. This would require students to attempt to make connections between their thoughts and the science ideas they were learning about. 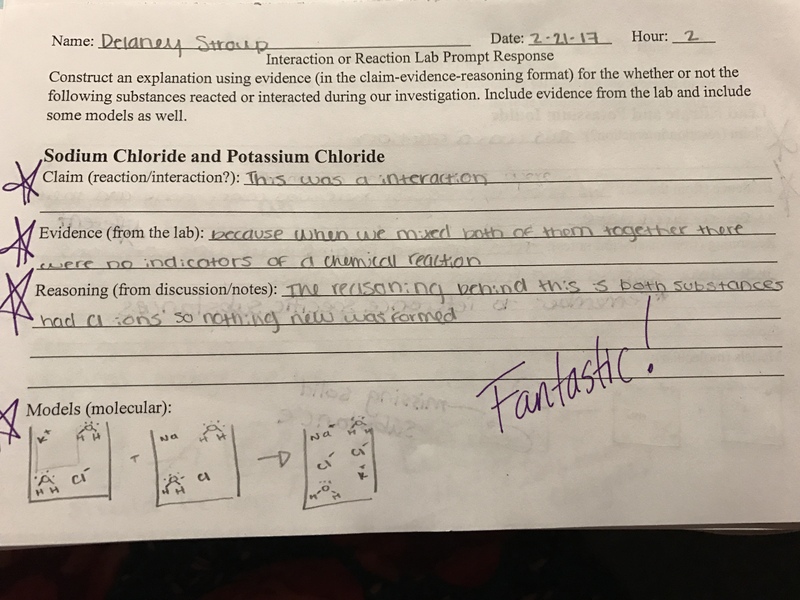 I thought this would be the easiest thing I could begin in my classes and that I’d start with my Chem 2 students; this group was used to me always trying new things and would be willing to follow me down this new path. 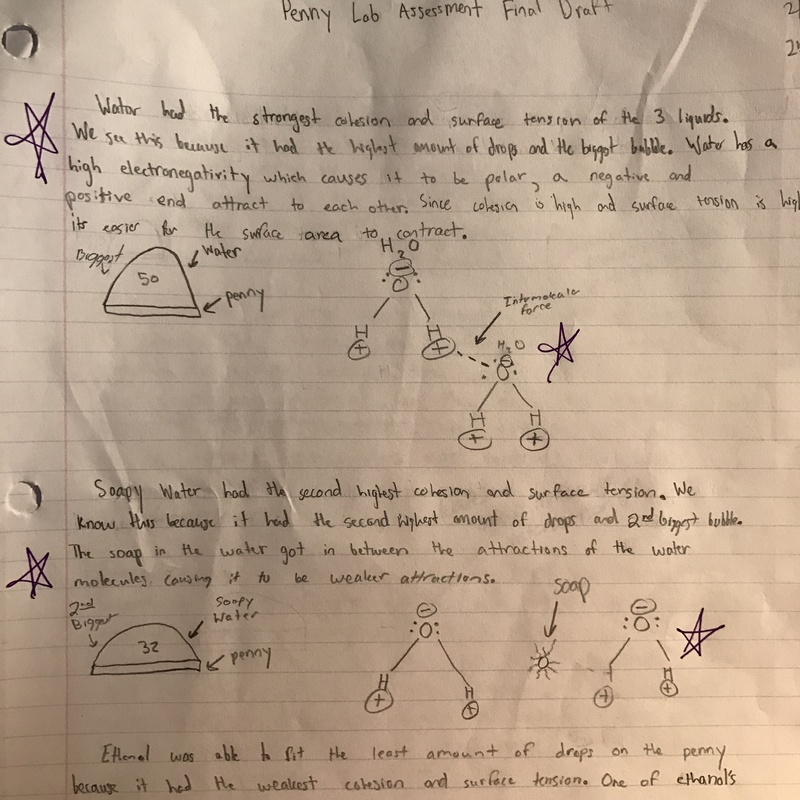 We struggled ALL semester; my students would have definitely loved for me to give up the writing part but I was convinced of the importance of communicating through writing – after all, they WILL have to do this once they graduate from high school. Learning how to gather their thoughts then write them in a coherent fashion is an important skill set that I wanted to help them learn. I’d remind students it was about progress: reading the feedback I’d provide them, and then adjusting based on feedback to try again. 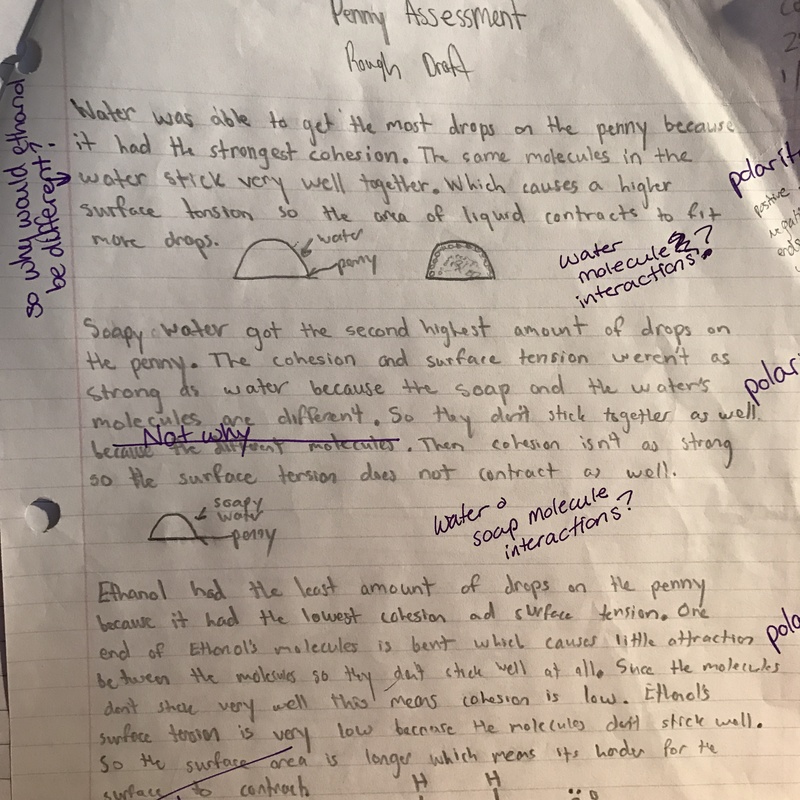 I began to see that through their writing I was better able to find their disconnects with the concepts and in turn, I was able to adjust my teaching to meet those needs. Depending on their grade, some students would read feedback to rewrite their explanations but not enough of them. To me, that wasn’t good enough. I planned on learning more over the summer to adjust weaknesses I discovered and I planned on incorporating writing in all of my classes, not just Chem 2. This meant finding a way for my freshmen and sophomores to be successful while not hindering the few juniors and seniors trickled throughout my classes. Reasoning: Here is where you tie in the science concepts, aka “the because.” This is were students are to tell me the causes for their observations that led them to state the claim they decided upon. It’s the concepts/science-y part they were learning in class. Modeling: While this piece has not traditionally been a part of constructing explanations/science writing, I believe it to be one of the most important pieces! Students should be able to not only tell me the causes for something, I want them to be able to show me through illustrations. I want them visualizing what is going on as they are writing. I feel like this helps in making them think about what they are doing. I DO NOT write down examples before students do their own writing. I made this mistake early and will not do it again. If you write down an example of what one of their explanations *should* look like, 90% of your class will write their explanations to mimic it. I don’t want their explanations to read like mine, they don’t think like I do, nor do I want them to. I am here to teach them how to think, and their thoughts are worthy of being used. During our small group and whole class discussions I’ll provide examples out loud of each piece but do not write it down. I’ll even reiterate expectations for each piece of their explanation but I WILL NOT write down an example. I want students to think and by writing down an example I take that away from them because they’ll just make their examples identical to mine. Scientists do not write identical explanations yet we can understand each other; that’s due to an understanding of how to use science ideas in explaining a phenomenon, which is what I’m trying to teach my students. There are a variety of ways to get science ideas across and I want them to share with me their thoughts, not mine. NO GRADES on writing assignments if full understanding is my end goal. Too often I provide feedback that is ignored. Giving a student a grade gives them permission to stop. I no longer give grades on a students first attempt at their explanation. I only provide feedback, then the student must rewrite their explanation based on the feedback. Then I give the grade. Does this take longer/more effort on my part? Yes, but that’s my job as a teacher; providing meaningful feedback in which students can process, adjust, and grow from. Time is the enemy here so in order for feedback to be purposeful I’m learning to make these writing prompts short and sweet. Ask questions using the terms that’ll help students construct their explanations. Even with the framework students will struggle with collecting their thoughts, this is why it is important to structure discussions by using terms and questions that get them thinking like scientists. 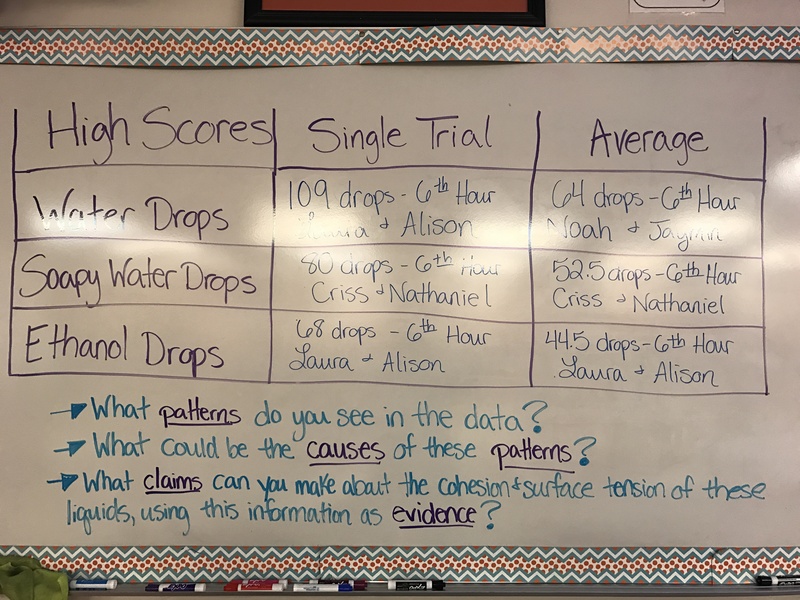 Instead of asking “What information does this data/evidence tell us?” ask students more focused questions like “What patterns can you see in the data?”, “What similarities/differences do you notice?”, and “What kind of claim(s) can you make using this information as evidence?”. Getting students to learn how to use the terms you want to see in their explanations during the discussion time will really help them when it’s time to begin writing. Short silent sustained writings before/during/after investigations can also provide time for students to gather their ideas/thoughts. I’ve also done small group explanations first followed by individual responses. Differentiate in feedback. Have a student that thinks they know all things because on quizzes they consistently make A’s? Provide feedback that is also focused on flow, grammar, precise language, and effective sequencing. Or have a student that really struggles? Focus more on content, ideas, and all information being present. Feedback can easily be differentiated based on student needs allowing you to push all students. I feel this has been the best way for me to help those bright students while not leaving behind the ones that struggle all while addressing the same standard! Parents also need time to adjust to this type of science teaching. Maybe it’s the group I have this year. Maybe it’s the fact that I have lots of freshmen/sophomores who have “never struggled before”. Or it could simply be that it’s new, but this year I have had more parents question my teaching when their student received a low grade on a writing assignment than I have before. The important piece is that I’m very transparent in my expectations, always go back to the framework used in class (claim, evidence, reasoning, models), and make connections between why it’s important for students to learn how to communicate in science rather than be able to repeat facts that could be googled. Typically after a conversation or two, they understand that I’m not out to “get” their student rather I am trying to get students to think about the how’s and why’s of science rather than the what’s. Also when I tell parents that their student had the opportunity to rewrite a first attempt after being given written feedback before he/she received that grade, settles them down. Students somehow always leave that part out…. Future goal: Peer Reviews. This is a step I have not done yet but is one of my goals for this semester. I want students to provide feedback to each other. I feel this is a great learning tool for both students involved and it would help with time, which we all know is very limited with teaching. Is my process perfect? No but it’s working. I do have to constantly remind myself that I am a small piece in their educational journey. The growth I see may be little but hopefully as students move on from my class to the next, that teacher will not be starting from scratch. Students have begun to automatically draw models and rewrite their rough drafts without prompting; to me that is progress! Below I’ve included some student examples along with my feedback. If you have questions, remember just to ask! Here is one students’ rough draft and final draft. We were studying how molecular level interactions affect the bulk scale properties of surface tension and cohesion. We then moved on to how water interacts with different substances (ionic vs covalent) and then whether a reaction occurred or if it was just an interaction. The first two were for an interaction only (sodium chloride and potassium chloride), and the third one is an example of a reaction explanation (lead nitrate and potassium iodide).